She is unsettling, beautiful, full of intrigue, elegance and mystery. One of the most important figures in realistic tattoos today, the sugar skull woman is the most loved feminine figure in the world of tattoos. Not everyone knows that this figure was inspired by Mexican folklore: she is the Dia De Los Muertos, represented in Mexico by and aristocratic, beautiful woman, with flowers in her hair, a sweet expression and a skull for a face. In Mexico she goes by the familiar name La Catrina, but she is also known by other names (Calavera Garbancera, Santa Muerte, sugar skull woman…) and she represents a modern interpretation of the goddess Mictecacíhuatl, the Aztec Queen of the Underworld. 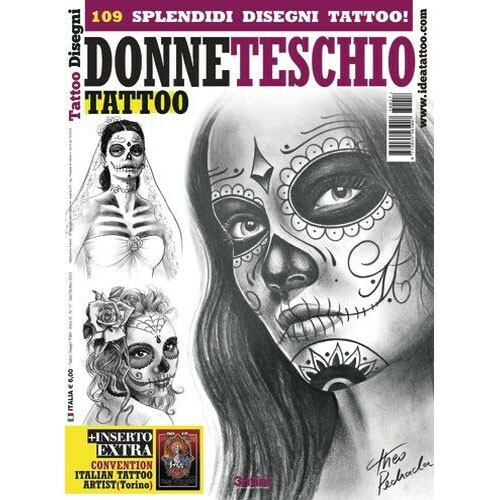 Ever more popular in the world of tattoos, the sugar skull woman reflects the technical skills and talent of the tattoo artist. The Mexican mask remains the primary inspiration for the sugar skull, but the subject is also interpreted using other female figures, from the Geisha to a mermaid, which naturally you can find among the designs of this special collection. 64 pages, 21x28 cm, 109 tattoo designs. Black & grey, with just line-work and in color.